The adult stable fly, Stomoxys calcitrans, is one of many biting, blood-feeding insects. Photo: Stephen Ausmus. 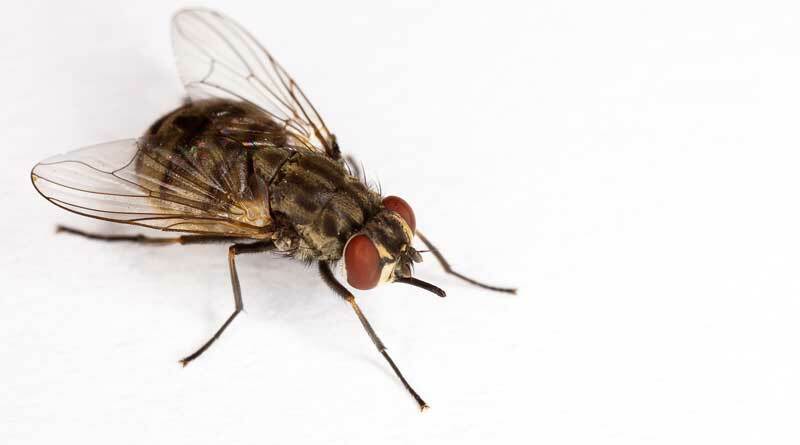 A new stable fly trap, now on the market, catches more flies than the standard trap, according to a recent study. The Knight Stick trap is highly attractive to stable flies, fits in tight places and is very portable, said insect specialist Jerry Hogsette, with the Mosquito and Fly Research Unit at the Agricultural Research Service Center for Medical, Agricultural and Veterinary Entomology in Gainesville, Florida. Experiments showed that the Knight Stick was a major improvement over the standard Olson Sticky Fly trap when it came to trapping stable flies. This trap is intended for outdoor use. Stable flies can travel for miles and are tough to control in rural and urban areas. Females lay eggs in wet, organic materials such as hay, manure, compost heaps and grass clippings. Both males and females feed on blood, delivering painful bites to livestock, pets and people. For livestock producers, these attacks can be costly. A 2012 Agricultural Research Service economic impact assessment found that stable flies cost the American cattle industry more than $US2.4 billion each year, reducing milk production in dairy cows, decreasing weight gain in beef cattle and lowering feed efficiency. Insecticide treatments are used to help keep stable flies off animals, but treatments wash off as cattle walk through wet grass or wade through water. Traps can augment or replace insecticides, surveying and helping reduce stable fly populations, which benefit animal health and welfare. In the study, published in the Journal of Economic Entomology, Knight Stick traps with sticky wraps were placed at several horse facilities and at an exotic animal rescue facility for 24 or 48 hours, depending on the existing stable fly population levels. The Knight Stick captured three times more flies than the Olson trap. A second study, published in Zoo Biology, found that traps placed inside zoological park exhibits captured five times more stable flies than traps along exhibit perimeters. Knight Stick traps have also been evaluated around beef and dairy cattle and other domestic animals with similar results. Although Knight Stick traps cost slightly more, customers like the dramatic increase in the numbers of flies captured, the ease of servicing the trap, its small size and in particular its portability, according to Hogsette. The trap itself also is a one-time purchase: only the sticky wraps need to be repurchased as needed. The Agricultural Research Service is the US Department of Agriculture’s chief scientific in-house research agency.